Branson is a great city to come and have fun in. As the hustle and bustle of the tourist season come to an end, the car lines are much shorter around town as families are preparing to return to school and work. With the reds and the oranges beginning to paint the hills with the changing of the leaves, the scenery is breathtaking. So far this season, Branson Ridge has been making a lot of updates to the resort. We started things off by replacing the roof and enclosure on our indoor pool, as well as many restorations to the outdoor pool. We’ve also had a tree removal project taking place, making the park more accessible for our members and guests. Along with renovating our rental cabins and cottages, we have added new horseshoe pits and picnic tables. Rounding the summer out, the resort has undergone a nice WiFi upgrade, making the members very happy! Here at the Ridge, we’re excited as David Jordan and Melanie Brown have joined the activities team. They have been getting to know everyone at many of our events. With so many activities taking place, ranging from watermelon games, pool parties, and bingo, to bonfires and hot dog roasts, they have been working hard to keep us all entertained. 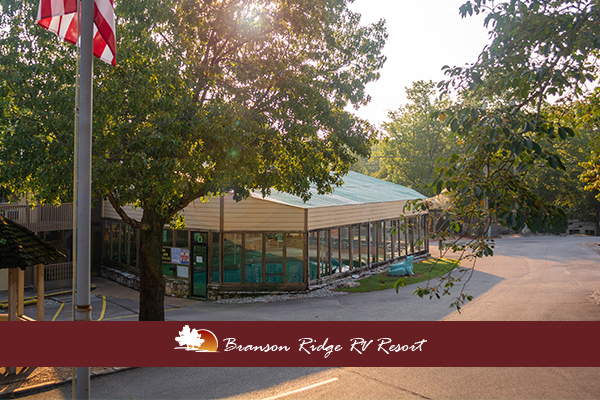 Branson Ridge will be ending the season with an ample activity load. We will be upgrading our activity area and building a new amphitheater for our activities. In September, we are having a USA Week, and Fall Fest. Our famous “Witchy Weekend” will return in October along with a lot of campfire fun. Then, in November, we are honoring our Veterans with our “Thank A Veteran Week”. So, come on out and relax with us while you still can!